More recently, developers have added a new structure is a forest mansion. This is a huge mansion where you can find many useful items and fight with the creatures living inside. What do you say when you get a new dimension? 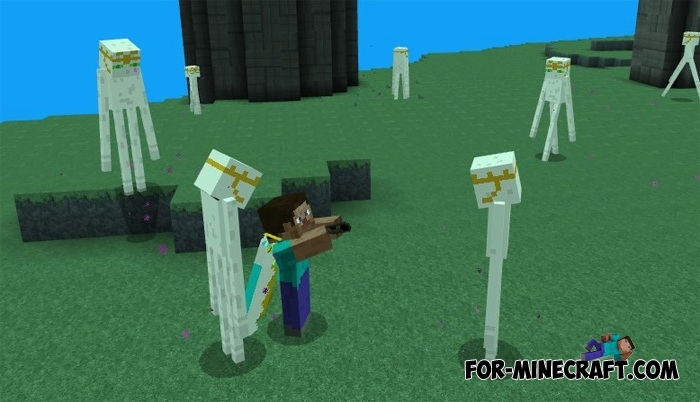 Aether Dimension addon replaces the end with a fantastic place where you can meet unusual and dangerous mobs or find unique things that do not exist in the ordinary world. Aether dimension was built on the basis of the end, but having got here you do not immediately understand what you need to do. Although your goals are simple: to kill the dragon and get a reward, and of course to find the necessary items, for example, unique blocks for decorating your house. Do not rush, your opponent is very strong and can stand up for himself. Therefore, before diving into the portal you need to choose things things: the best sword and armor and do not forget about the potions that can save you in a difficult situation. How to get to the dimension? First, build the portal. 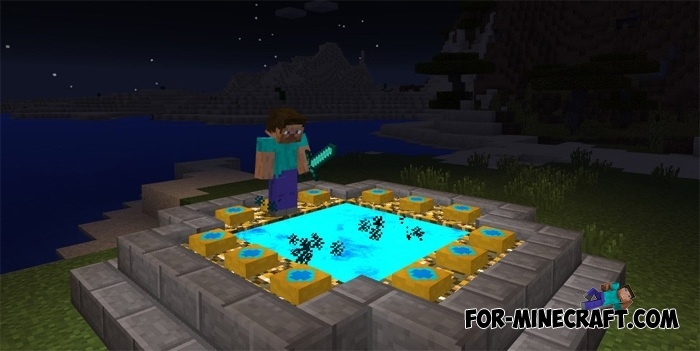 This is not difficult, because the portal consists of 12 blocks and keys. Place them as shown in the screenshot and activate with the keys. Once you are ready, then jump into the center of the portal and get ready for a little test of your strength. Almost immediately you will find a kind of enderman which attacks its opponents. Try to deal with a couple of such creatures, they serve as a dragon guard. If you survive, the Aether dragon will try to take away your life by shooting the wind balls. On the one hand you will get a harmful effect if this ball hits you, but it does less damage than fire one. The dragon receives energy from special crystals, destroy them to defeat it. In addition to the new dimension, the Aether Dimension addon includes new things. They replace the standard ones and look a little different. They can become a good decoration or used as a protection. Magic Balls addon for MCPE 1.0.4.1There are times when you need a weapon for attack or defense. So forget about it, the Magic Balls addon replaces the usual swords..